This is the land where the west was won and these beautiful Sugar Bandits ride through in style. Lay your cards down and finish that glass of whiskey because these babes don't mess around. Mosey your way on down to Main Street where you're in for a root'n toot'n good time. 3, 4 or 5 Scatter Symbols in any position trigger the bonus feature. 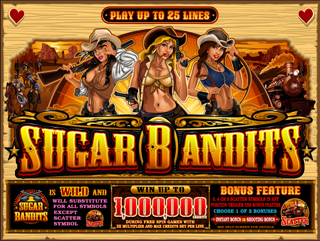 Aim and shoot your pistols at as many targets as you can to win Free Spins and Multipliers. Shoot a cannon ball to ignite your winning credits.